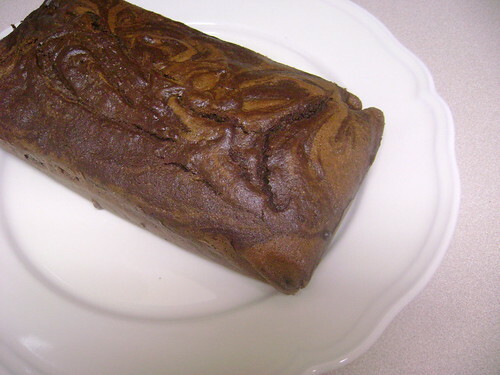 I decided to try out this recipe for a cinnamon marble cake that I found on the blog Celiac Teen, but with chocolate. In fact, I should actually say that I derived inspiration from it: I went to the kitchen, set on making the cake as instructed, but when I started getting the bowl out in order to make it, my creative fires took control so much that this cake does not resemble the original cake at all, I think. The only instruction I did follow to a tee was the oven temperature and making sure not to preheat it. Instead of creaming the wet ingredients with the eggs and adding the dry ingredients, I beat the egg yolks and whites, separately: beating the whites to soft peaks, and beating the yolks with half the coconut sugar until it reached the ribbon stage. My motive behind beating the whites was in the hope of giving the cake a bit more rising power, thinking of what Lauren said about how the cake didn’t rise that much. I was going to use four ounces of chocolate (it sounded ideal in my mind), but, using what I had on hand, it ended up being half that amount. I think two ounces is good, but adding an extra two ounces would make this cake even chocolatier. In that case, with the extra two ounces I would increase the cocoa powder to 2 tablespoons. You may use another size of loaf pan, if preferred or if you don’t have the size specified available. The size specified is my only loaf pan at the moment. You could also use a round cake pan. 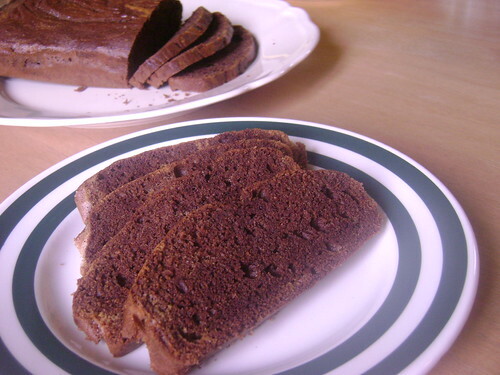 Liberally adapted from Gluten-Free French Desserts and Baked Goods by Valerie Cupillard. Original recipe found on Celiac Teen. Stir in grapeseed oil and remaining coconut sugar. Fold in almond flour and baking soda. Add almond extract. Separately, beat the egg whites with salt until soft peaks form. Add a third of the beaten whites to the batter, fold in 1/4 cup brown rice flour, and add another third of the beaten whites. It’s around this stage that bubbles start forming in the batter. Finish by folding in remaining 1/2 cup of rice flour, until fully mixed, and mix in the remaining beaten whites. Divide the batter, pouring half into the prepared loaf pan. Melt the dark chocolate in a stove-proof bowl set over a saucepan of simmering water over medium heat. Stir frequently, until completely melted. Add cinnamon and cocoa powder to the other remaining half of batter. Mix in the melted chocolate. 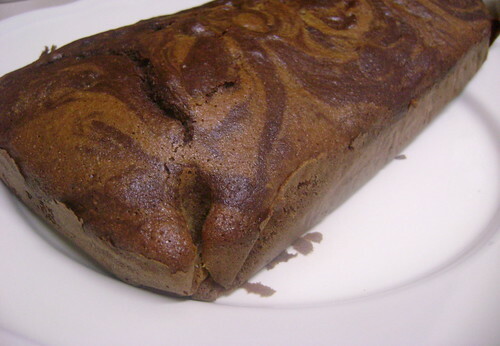 Drop the batter by spoonfuls on top of the batter in the loaf pan and swirl around with a fork or knife. Bake in an un-preheated oven at 400ºF for 25 to 30 minutes. When done, a knife inserted should come out clean. Cool before slicing. Eat as is, or dip it in melted chocolate or chocolate sauce, or with condiments of your choice. Enjoy! Looks great. I make marbled cake all the time and have my easy-favorite recipe too.. so I always look out for interesting variations that I can try. Thanks for sharing this cinnamon twist.